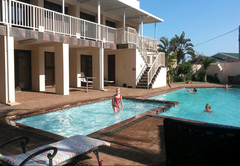 Banana Beach Holiday Resort is a highly recommended property providing self catering in Melville Beach for tourists visiting the South Coast region. 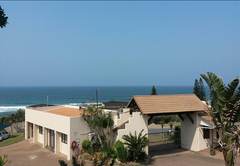 If you are looking for a relaxing holiday, or for a fun filled adventure, Banana Beach Holiday Resort will act as a ideal base from which to launch your holiday experience on the South Coast and with our cosy Port Shepstone accommodation, beautiful gardens and friendly personnel, you are assured of a value for money holiday that you will never forget. 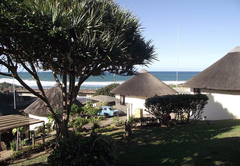 Located on the popular Hibiscus Coast, between Hibberdene and Port Shepstone, Banana Beach Holiday resort offers one a true fun filled relaxation. 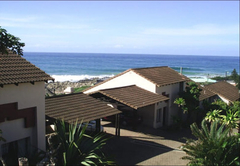 Located only 50m from the beach one is assured of an awesome sea views, and a truly relaxing and enjoyable holiday for all members of the family. 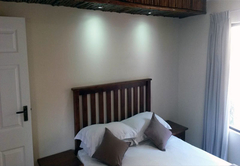 We have got 26 luxury chalets, varying in sizes to suite almost any family size.All the units have a full or partial view of the sea in the horizon, and are comfortably built to ensure that your stay is as memorable as the view. 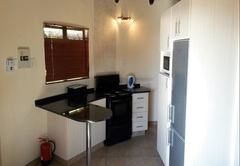 A two bedroom unit, with bathroom, fully equipped open plan kitchen, dining room area, lounge area with TV (6 channels), carport, veranda with built in braai (BBQ) facility. 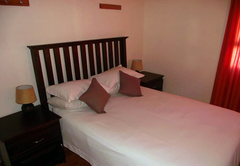 2 Bedroom Chalet, main bedroom with a double bed, 2 single beds in the second bedroom, 3 single beds on the loft, and a day bed in the lounge area. 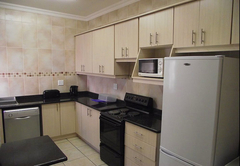 Fully equipped open plan kitchen, dinning room, lounge area with TV (channels). 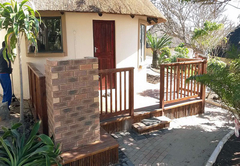 Carport and veranda with built in braai (BBQ) facility. 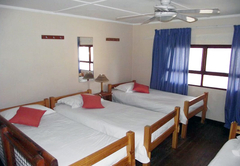 This spacious 4 bedroom house can sleep a total of 10 people comfortably. 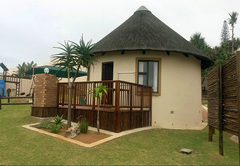 It has an open plan lounge, TV (12 channels) and dining room area, 2 bathrooms, a fully equipped kitchen, large verandah with built in braai facility. 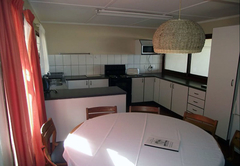 This unit is ideal for large groups, or a family. 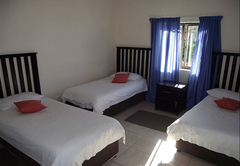 On site facilities include a games room with pool tables, table tennis and video game. There is a play area with trampoline, jungle gym and volleyball court. There is a laundromat on site for your convenience at a nominal fee. 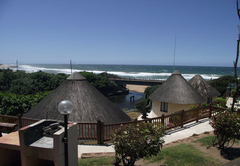 The lagoon (pier) is the ideal spot to sit and relax, while you do some fishing. 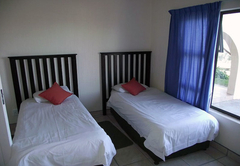 The facility also has a lapa area that can be used for functions, or to just relax and while waiting for the big one to bite. 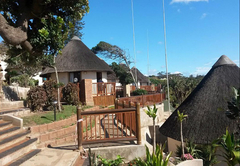 Take some time to walk through our well maintained gardens and view and identify our beautifully cycad collection of 7 different species of cycads. While on the walk you can also view some of the other fantastic plant life in our gardens as well as the various bird species that are found in our area. 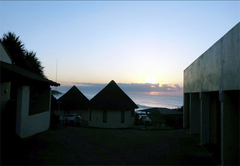 Chalets overlooking the sea was beautiful. Units were in satisfactory condition. In need of some upgrades. Units serviced on Saturday. Facilities were good. Children's games (jumping castle, jungle gym) was good. Pool area very good neat, tidy and clean. Volley ball area needs to be refilled with more sand. Lots of small stones and hard rock present. 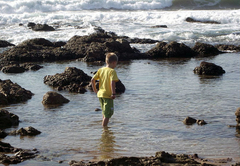 Walk to the beach less than 100 metres. 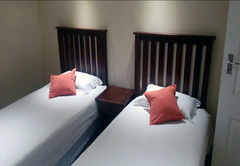 Overall it was an enjoyable stay. 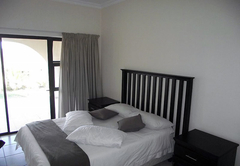 Very clean, spacious and nice accommodation. 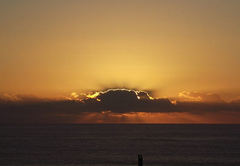 Close to the beach, very friendly service, very good prices. I can recommend this place for everybody. 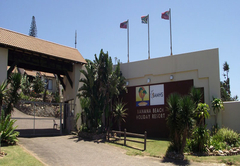 Response timeBanana Beach Holiday Resort typically responds to requests in 5-10 minutes.